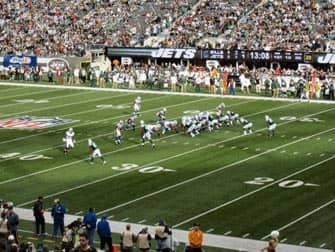 New York Jets tickets can be bought online before your trip to New York. 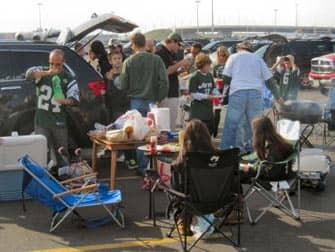 Jets games are popular so it is smart to plan ahead. 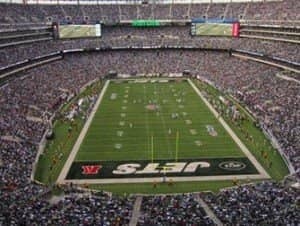 The Jets games are held in the MetLife Stadium and the American football season runs from September till January. If you can’t get tickets to a Jets game, check whether the New York Giants are playing. “Cheap” tickets start around $100 to $130 per ticket. 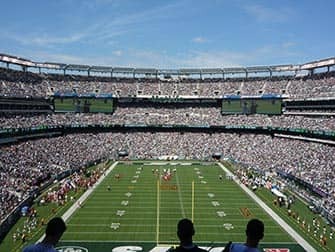 Buy New York Jets tickets now and pay no service fee and get a free shipping (e-tickets) or choose free local pick-up! Buying tickets for a Jets game is possible when you plan well ahead. Every Jets game is sold out. The waiting list for a season ticket is eight years long! View the dates here for when you’d like to visit a New York Jets game or see the table below. The tickets can be paid by credit card and are either posted to your address or sent by email. There is also an option to pick up the tickets in New York for free. If you can’t print out your e-tickets, you can also drop by this local pick-up point. The office’s location is central, near Times Square. E-tickets are always delivered the fastest and local pick-up is the best option for all other tickets. Both options will save on shipping costs, so I would highly recommend either option. Your tickets are 100% guaranteed authentic and delivered on time. The tickets sold at discounted prices on the site are from season ticket holders who can’t make it to game. When there is a high demand of tickets the tickets are sometimes more expensive than the original price. Good seats are vital when watching an american football game but there is one rule: if you’ve managed to get tickets with any seats, you are already lucky! The MetLife Stadium is huge, but built in a way that you still have the feeling of sitting close to the field. I have marked the areas for best seats in red in the picture below. However, if you find those seats too expensive, then please try for seats higher up, because it is more important that you get to attend a game than trying to get the best seats. 1) Take the train from Penn Station on 34th Street and 7th Avenue in Manhattan. Buy a ticket at either the counter or the machine for the MetLife Stadium. You take the NJ Transit rail to Secaucus, New Jersey (the trip takes about ten minutes). Here, you will transfer to a train that takes you to the stadium. This train will also take about ten minutes. You don’t have to worry about finding the trains, because you can just follow the crowds of fans traveling with you. Trains begin running three hours prior to kickoff and run until two hours after the game ends. The total cost are $11 per person for a round trip. 2) You can take the Coach USA Express bus from the Port Authority Bus Terminal in Manhattan on 42nd Street and 9th Avenue. The buses start running 2.5 hours prior to kickoff and run until one hour after the game ends. Ticket costs $12 per person round-trip. Note that buses can get very busy after the game, but everyone ultimately gets a ride back to the city. It’s a good idea to arrive on time (1-1.5 hours before). You will have enough time to experience the pre-game activities and hear the national anthem. It’s easiest to get back to Manhattan by public transport. If you purchased round-trip, then return the same way you got to the stadium. I prefer to travel to the MetLife Stadium by train, because it is easier. However, the bus is also a good option. Eric’s Tip: The MetLife Stadium is a great experience! Everything is very well organised and new. If you have the chance to go, DO IT! It’s awesome. You can bring along a small camera. Please note that no handbags or backpacks are allowed in the stadium. Same goes for any food, drinks or umbrellas. 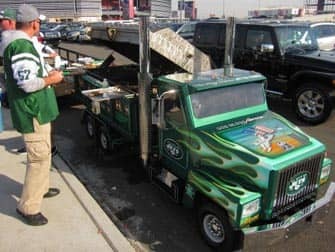 Arrive on time, because everyone will already be there tailgating which means basically barbecuing on the parking lot, it’s a very bizarre sight (see the photo below). Also take the time to walk through the entire stadium.